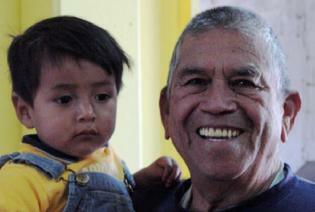 Frank Alarcon dedicated over 37 years of his life serving God through the Community Center of the Holy Spirit. He lived among the poorest of the poor, always there to serve others. He was an amazing teacher who taught not only through his words but also by example. Frankie is now in heaven. We continue God's work, caring for His poor, exactly as Frank taught us. In Frank's words, "Onward to serve Christ! Glory to God and thank you, Jesus!" We invite you, in the name of Jesus, to participate in His ministry in Ciudad Juarez. The Community Center helps children and families in one of the poorest sections of one of Mexico's most dangerous cities. Working in a neighborhood built atop an abandoned garbage dump, the Community Center reaches out to families to offer hope in the midst of hopelessness. "Hands for Christ Ministry" supports the Community Center. Won't you support Hands for Christ?